Where Writers Wrote in New Orleans tells what it is about the city that has always attracted the creative mind, in particular writers. 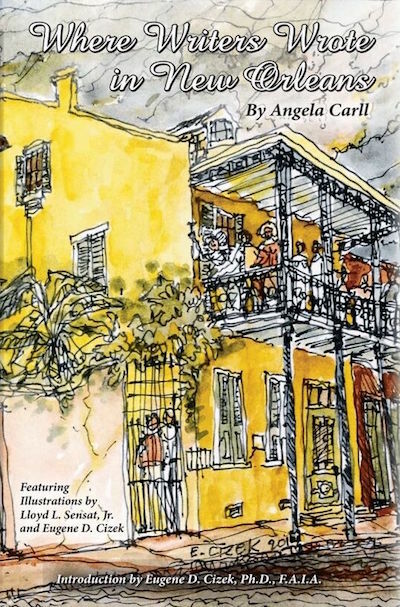 Author Angela Carll brings her many years as a realtor, newspaper real estate columnist and tour guide to identifying the kinds of buildings and neighborhoods that have housed our most celebrated writers --William Faulkner, Tennessee Williams, Anne Rice and Richard Ford, to name a few-- and hundreds lesser known. She includes restaurants, bars and other hangouts known for attracting a literary clientele and fills the pages with fascinating facts and secrets of the hundreds of novelists, non-fiction writers, poets and journalists who immersed themselves in the city's spirit as natives, part-time residents or long term favorite sons from the city's founding in 1718 to the present. This is a visually beautiful book with Eugene Cizek's wrap-around water color of Tennessee Willams' house in the French Quarter for the cover and pen and ink drawings of iconic buildings throughout done by Cizek and Lloyd Sensat. An introduction by Eugene Cizek, PhD F.A.I.A explains how the original Creole architecture of the city maximizes the use of light, air and the tropical environment creating, in his words, the spirit of time, place and humanity. In one of America's most loved cities where everyone is either a writer or aspiring to be, this book stands out as a fine gift item and also a treasured reference work.